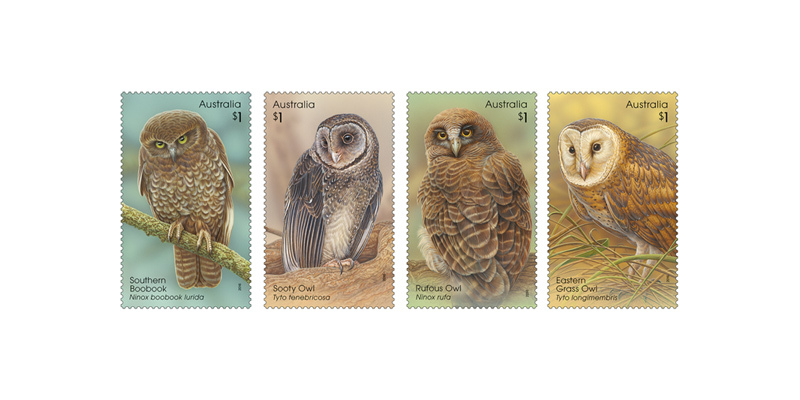 Among our approximately 750 species of birds in Australia, nine owl species can be found on the mainland and in Tasmania. 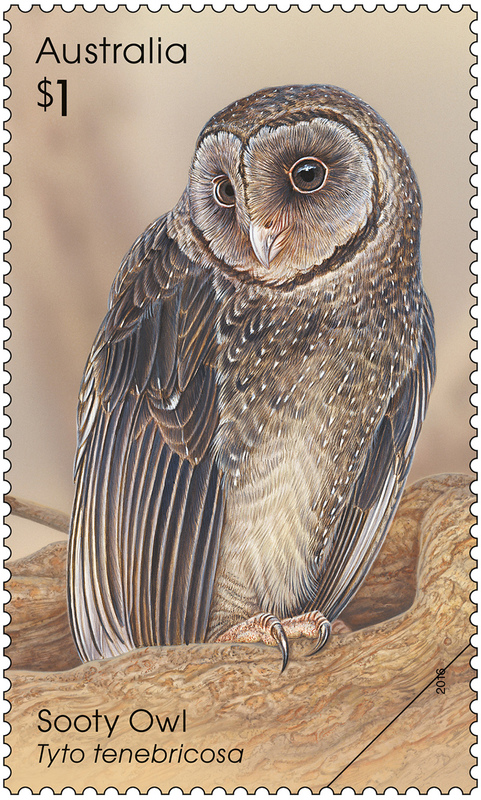 This captivating nocturnal bird of prey falls into two genera: Tyto (masked and barn owls) and Ninox (hawk-owls and boobooks). The former are distinguished by their classic heart-shaped facial disc, the latter by their hawk-like appearance. 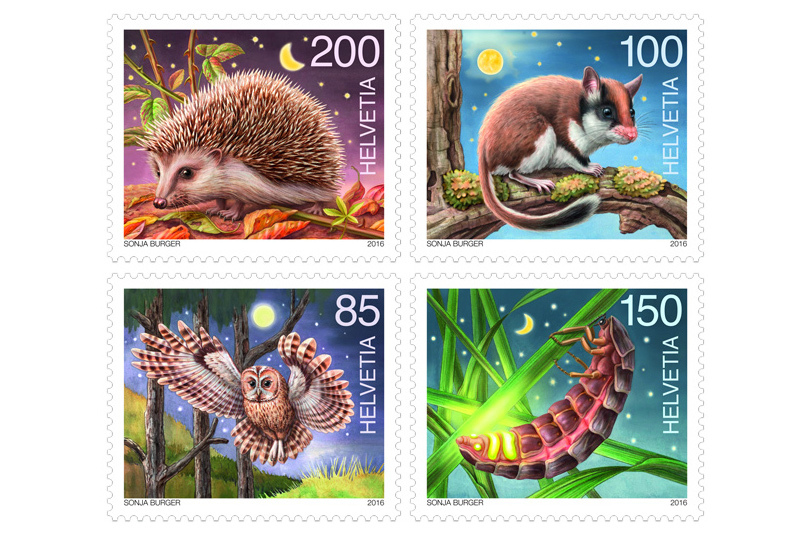 The two masked owls in the issue are the Sooty Owl and Eastern Grass Owl. 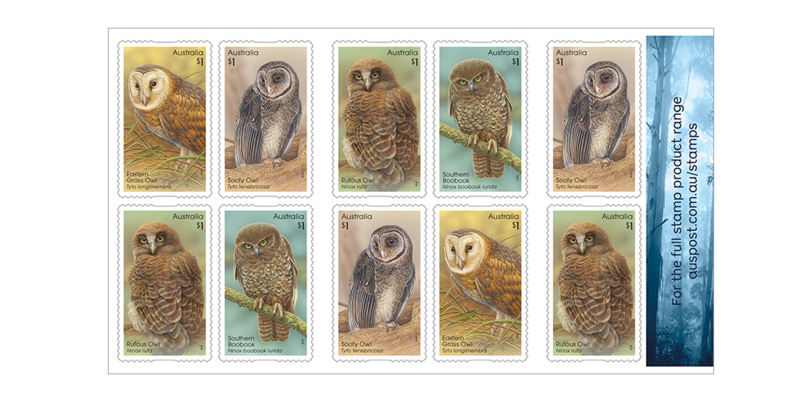 The heavily built Sooty Owl is larger and darker than its close relative, the Lesser Sooty Owl. 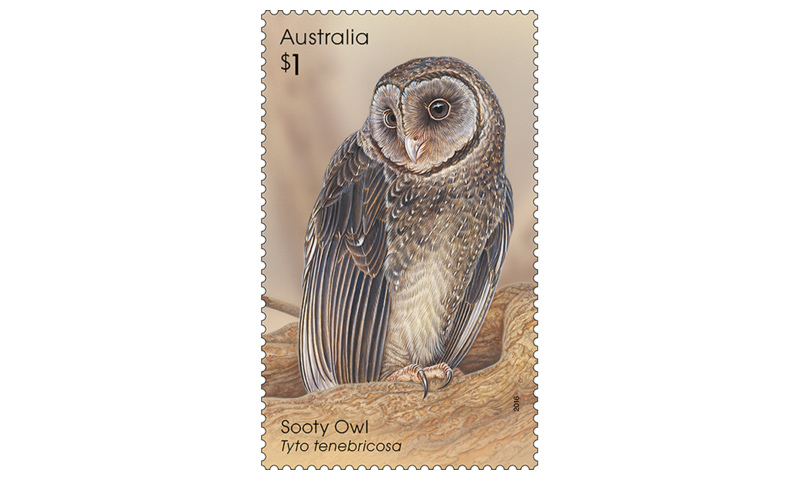 This very secretive owl occurs along the east coast, from central Queensland into southern Victoria. 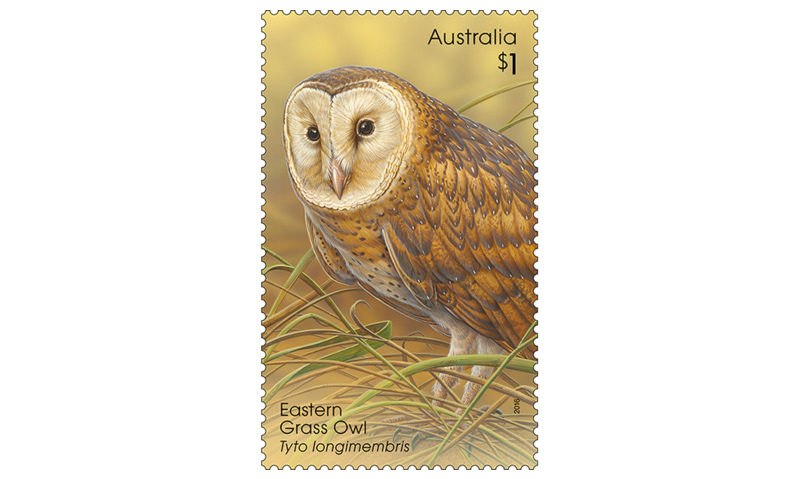 The comparatively long-legged Eastern Grass Owl is the only Australian owl species to live on the ground. It occupies open grassland and swampy areas across northern Australia, much of Queensland, north-eastern New South Wales and north-eastern South Australia. It spends much of its days in “squats” – cave-like hides that it builds in the grass. 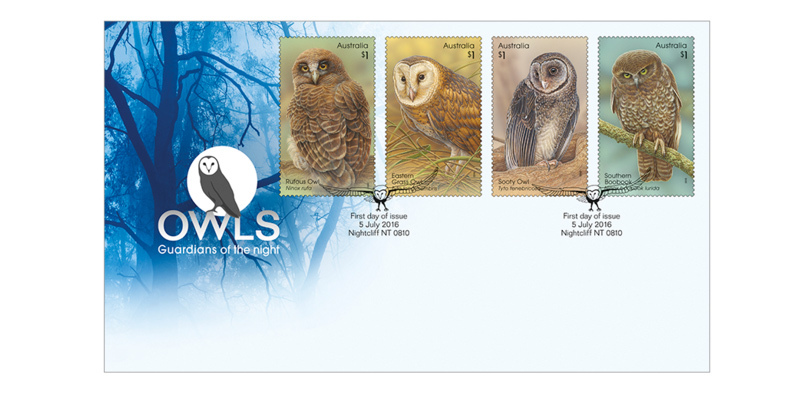 The two Ninox species in this issue are the Rufous Owl and the Southern Boobook. 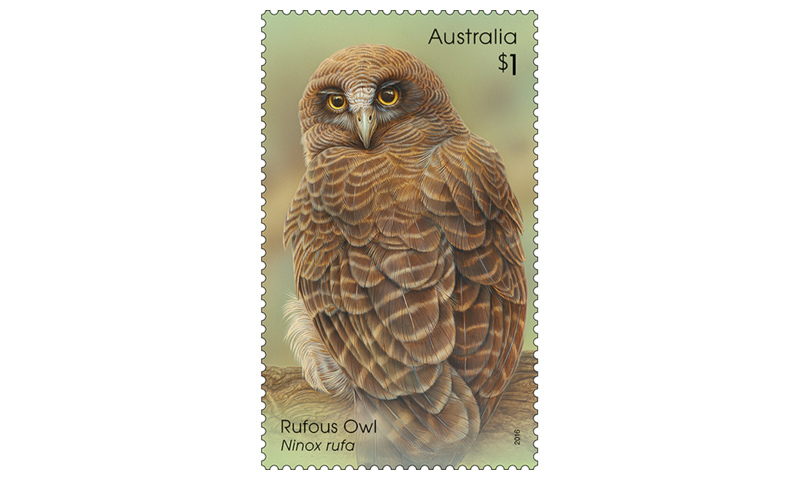 The Rufous is large at 45–55 centimetres, and its prey can include the Brush Turkey and Sugar Glider, as well as beetles. It is found in north-eastern Queensland and along the northern coast into Western Australia. 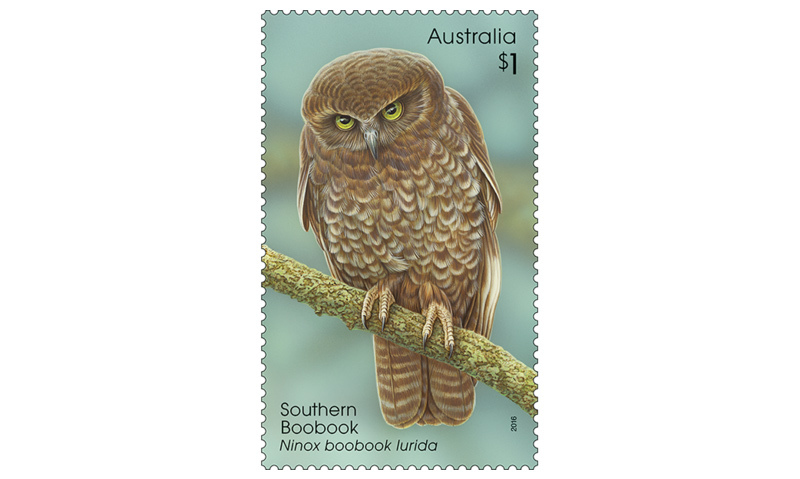 The Southern Boobook shown in the stamp is the subspecies lurida, which is smaller and darker than other subspecies and confined to around the Atherton Tablelands, in Queensland. 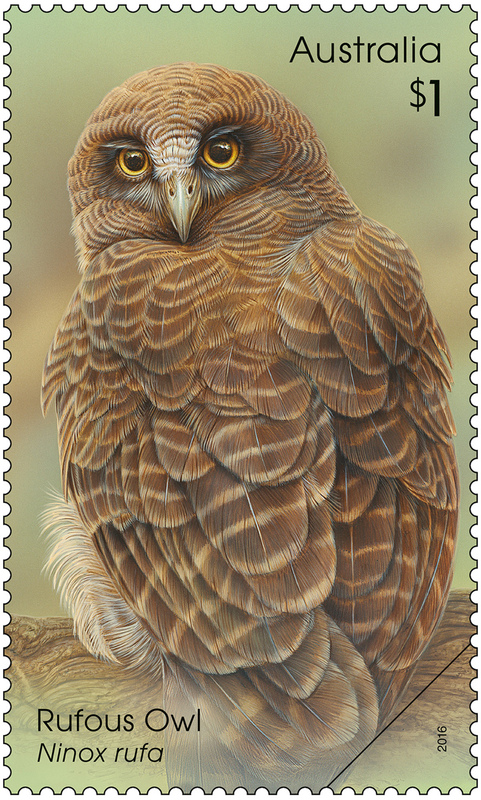 The smallest of Australian owls, the Southern Boobook is also the most numerous and widespread.